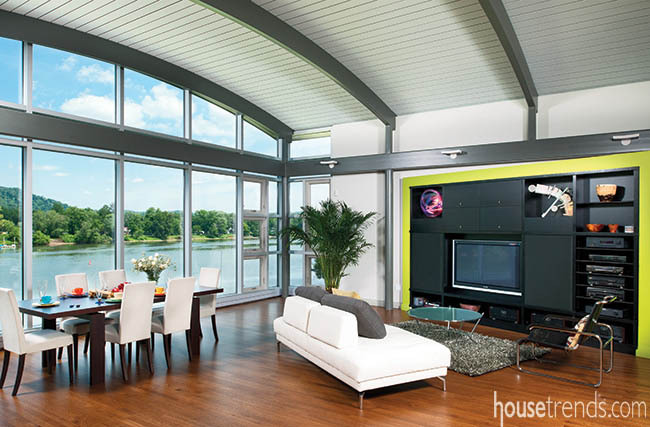 The dining room color ideas used in this space help to really make the area pop. Between the artwork seen throughout the room and the choice of paint colors, guests are given an eye-pleasing treat. 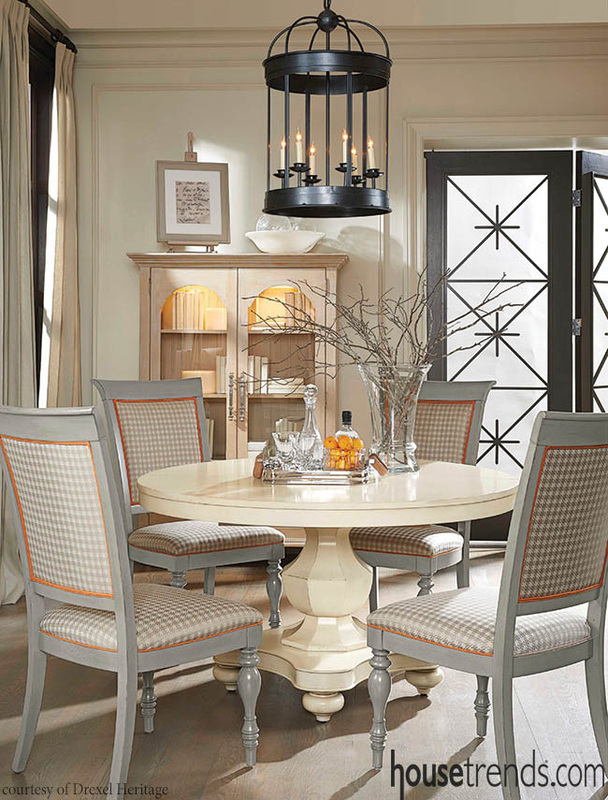 Are you ready to take the dining experience up a notch and entertain in your dining room? Here are some dining room measurement tips that will help you make sure your family and friends are comfortable. and the size, shape and height of the lighting fixtures. 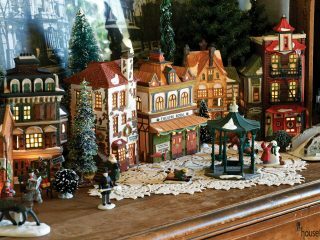 The shape of your table is best determined by the shape of your room, as well as the number of people dining. 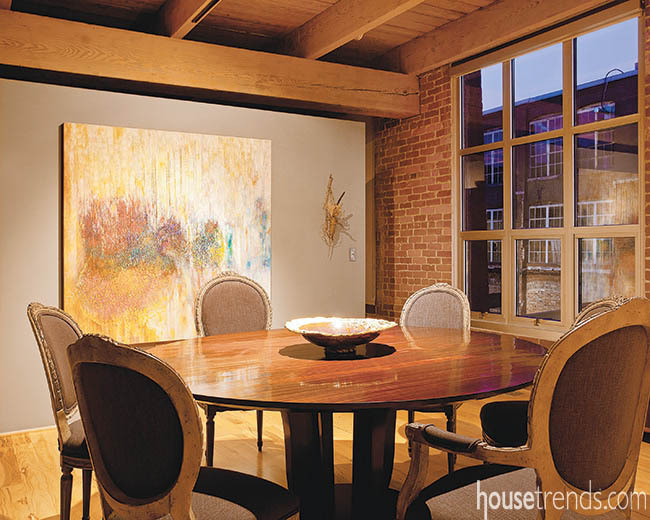 A round dining room table is a great option for a tight space with no corners to bump into. When designing your dining room, make sure to leave plenty of space in between the table and the wall. A distance of 42-48 inches is preferable, if people will be walking behind it. A great tip to keep in mind when setting a dining room table is to give 24 inches per place setting so your guests won’t bump elbows. The maximum table width should be 48″ to allow conversation and passing of plates and platters. The minimum table width should by 36″ to allow room for serving pieces in the middle of the table. The typical dining table height is 29-30″. The space you are furnishing is defined by the shape and size of the rug. For a rectangular table, select a rectangular rug; for a round table, a round or square rug. 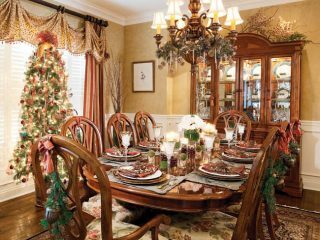 Generally, an 8’x10′ rug is sufficient for a standard dining table measuring 42″x64″ that seats 4-6 people. When choosing a rug, add 24-30″ to each side of the table size to allow room for guests to easily pull out and push in their chairs. Consider the statement your rug may make: selecting a rug with a bold pattern or color may be just the update your room needs, while a rug with no pattern, but great texture, may be the modern touch or sophistication your space is lacking. — To best visualize the size, use painter’s tape to map out the rug on your floor. — Consider other furniture pieces (buffet, console or china cabinet) that sit on or near the rug—taping it out will help with this. — It’s fine if the front legs of your buffet sit on the rug and not the back legs—use furniture pads to raise and stabilize the back legs. 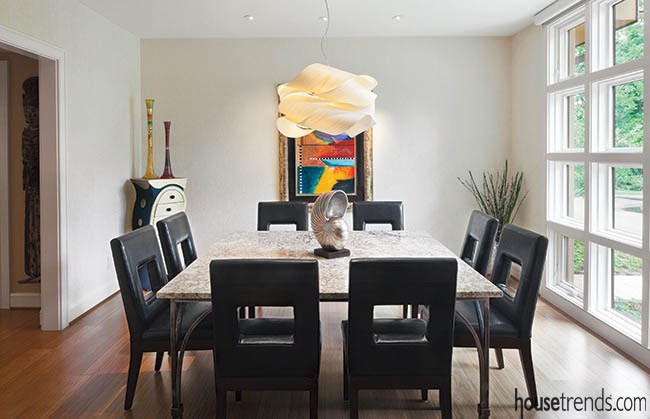 Lighting in your dining room can come from several places: overhead lighting from a chandelier above the table or recessed ceiling lights placed throughout the room, and perimeter lighting from wall sconces or lamps placed on a buffet or console. 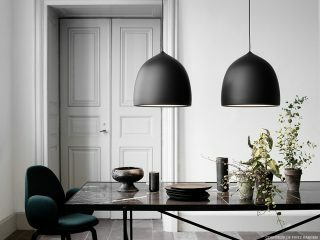 — If you love the idea of a statement lighting piece, the dining room is the perfect room to add drama. If your lighting makes a statement then keep other elements of the room understated so the result is sophisticated. 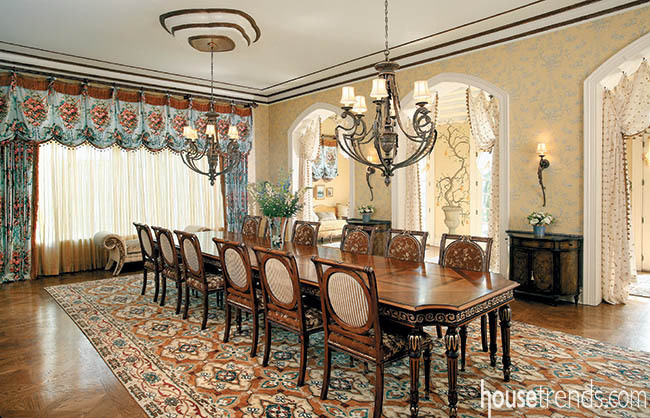 — If you don’t have dining room furniture yet, you can use this formula as a guide to select the optimal size chandelier: room width + room length = size chandelier (i.e. 10’ wide x 14’ long = 24’ so a 24” chandelier is the optimal size). Builder: Heinlen & Follmer Inc.
— If you have furniture already, it is more important to size your chandelier according to your table. 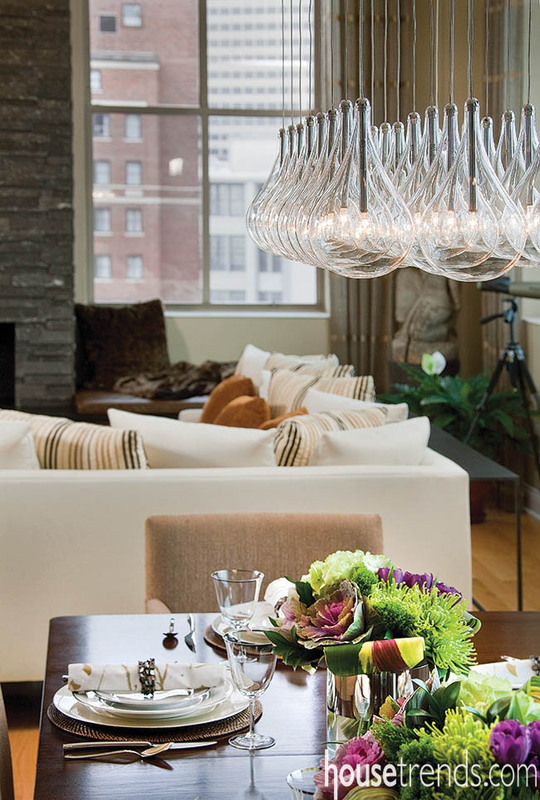 Therefore, keep your chandelier to one-half to three-quarters the size of your table width. 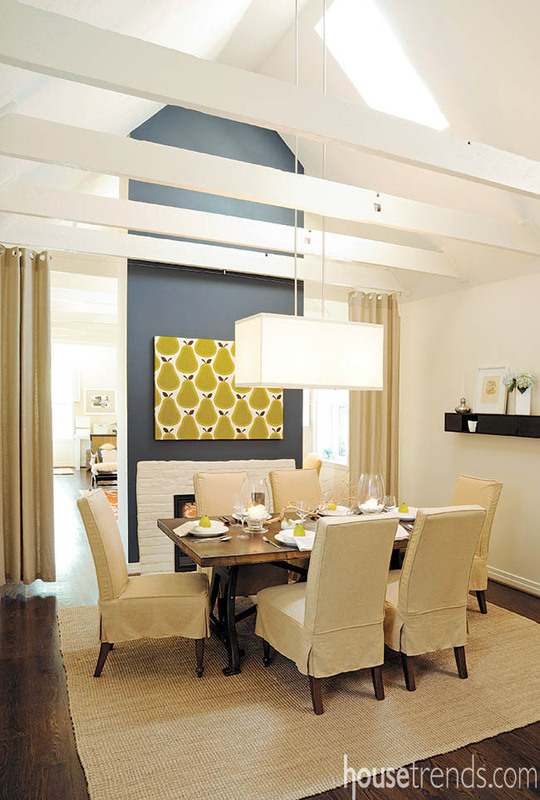 TIP: Rectangular chandeliers only work over a rectangular table. 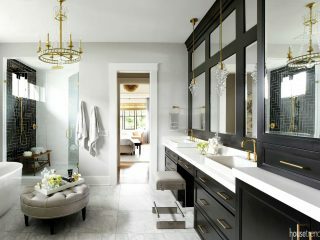 — Position the bottom of your chandelier about 30-32” above your table and center it over the table, not the center of the room, if those centers are different. 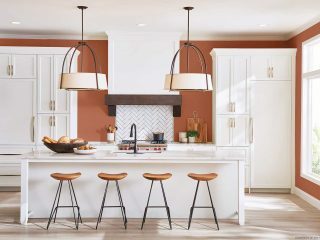 — Place your chandelier and recessed lighting on a dimmer switch to control the intensity of the lighting and extend the use of the space for homework and intimate dinners. 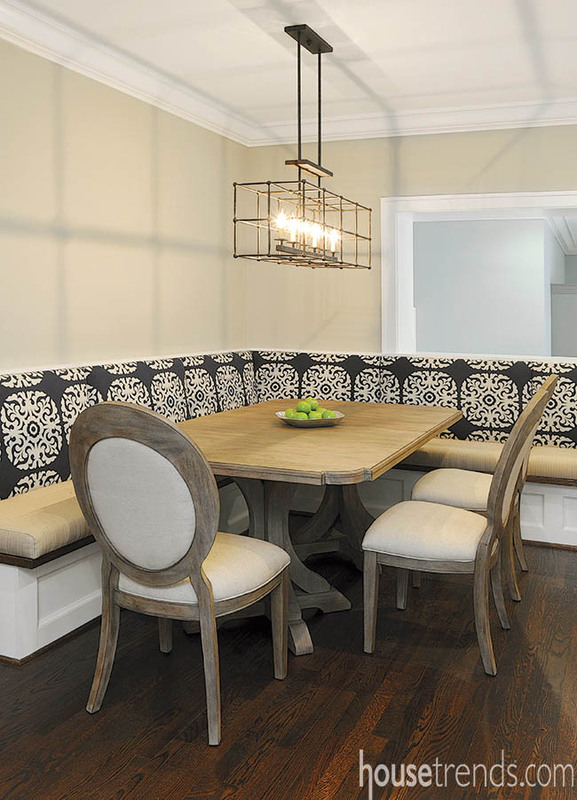 — Switch up your dining space with a bench, settee or banquette instead of using chairs all around. 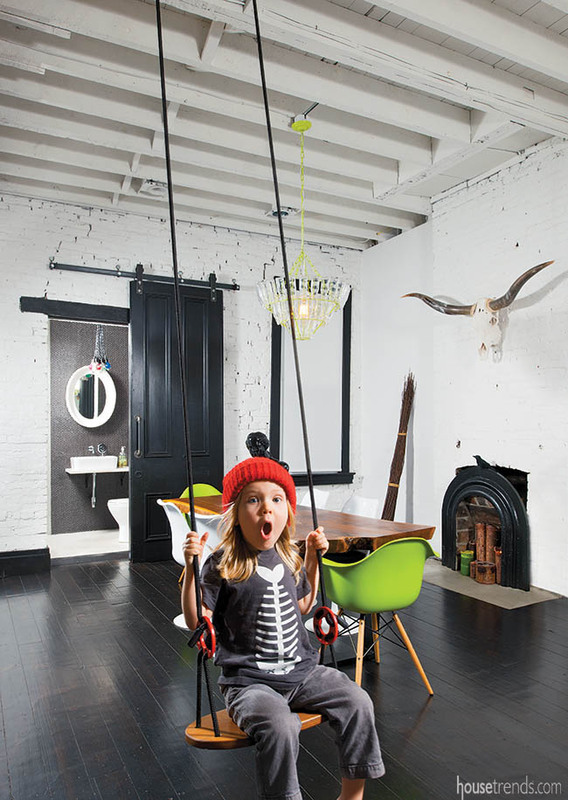 — If children or elderly people will be dining often, choose chairs that are lightweight and easy to move. 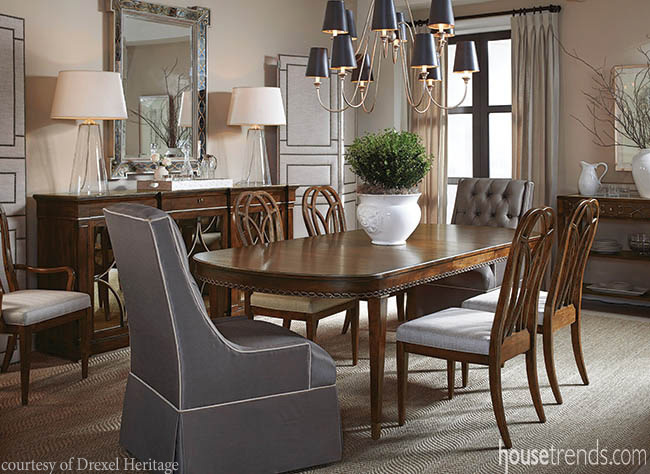 When selecting dining room chairs, keep in mind that the ideal height is 18-19 inches. It is also wise to allow for 12 inches between the top of the seat and the top of the table.